Weight: 23.4lbs Sizes: 10' , 10'6"
About the board: The Antigua is a beginner, inflatable board, offered at some of the lowest price-points in the market, but packing lots of value with beautiful graphics, a nice pump, and an all-around great package. It naturally misses some of the features of intermediate, advanced boards, such as faster glide, reinforced rails, and a more premium bag. 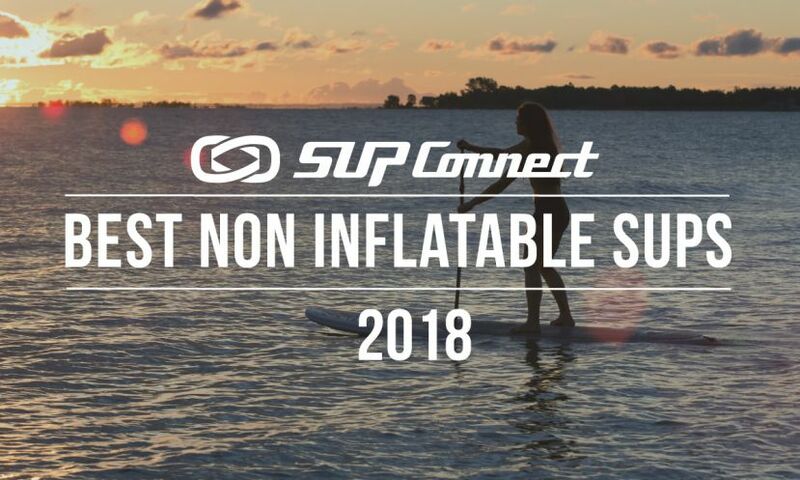 But it is an excellent value for that beginner, price-point inflatable board, well deserving of Supconnect’s “A” grade. Read more HERE. About the board:That is just a phenomenal A-Grade board all around. It has incredible construction and feels really solid. It has a dual-chamber build, meaning that you have to inflate the outer chamber and then the inner chamber separately, which for a touring board is excellent because if you’re out and about and you have lots of things loaded on the board and the board starts deflating, the middle chamber will make sure that you’re still floating and so it serves as an excellent safety mechanism. Read more HERE. About the board:If you want to ‘feel good’ about the board you own then the Feel Good from SIC Maui is a great choice. The board looks stunning and has a really beautiful coordination of graphics, from the traction pad to the color on the back rails and bottom. It’s a really nice all around board that can also be used for surfing. The board paddles really well and is quite easy to carry using SIC’s signature EZ grab handle. If you want something that you want to use to cruise short distances and dabble in the surf and look good for your friends this is something that you should look very closely at and consider having in your quiver. Read more HERE. Who is this for:The NSP Cocomat Performance Touring is the ultimate board for a heavy guy or big gal. It’s incredibly stable with the traction pad making it feel very comfortable on the feet. It has some lips towards the rails, that really sort of tuck you in inside of the deck. There’s lots of accessories with bungees on the nose and tail and the flat rocker makes it a real pleasure to paddle. If you are heavy weight and looking for something that will float you without hesitation, maybe put your kids on it, or go for a long touring expedition, this is the board. One of the things that got us to notice this model more closely this year is that there were major upgrades to the graphics making the board all the more attractive. Read more HERE. About the board: Yes, yes, yes! The Pau Hana Endurance is super fun. It’s very stable and is a great board for many uses. The Endurance can be great for touring, racing and all around family fun, making this board incredibly versatile. It’s also offered in Pau Hana’s Ricochet technology which makes the board virtually indestructible, which if you ask us is a huge plus. It has a beautiful finish and is arguably the most durable board around, which is a hard combo to come by. The board does come in at a heavier weight, about 31lbs, but the durability, graphics and fun factor alone easily carry this board into the A-grade tier.Read more HERE. About the board:The Pau Hana Malibu is a plastic paddle board that has changed the concept of plastic boards. Plastic boards to date have dealt with a number of challenges. One, the graphics tend to be very plain, usually just white boards. Two, they don’t have a really nice finish and tend to have a seam that goes all along the rails on the both sides. Three, they are quite heavy. And four, they also don’t float as well as composite boards, normally. The Malibu changes all of that. In fact, the Malibu is the plastic board that can fool you into thinking you are paddling a composite board and to boot it looks stunning. Pau Hana has done a really great job and at the price point it comes at it is an excellent board and a great buy.Read more HERE.